You know our world, our little automaticly generated room to test your creativity. This article will list, and explain certain world generational features, and configurable things. 3.1 Basic Setting, "Special Data"
Schist beeing generated, visible on mountains. Also you can see the first try of an exponential worldgen system. The surface of the world (alpha) is a typical by perlin generated surface with the only difference that it's not pure perlin. 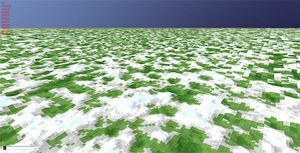 It's perlin2 which allows the terrain to loose it's cubiness. You might know there is more behind a world than you can simple see, and the world isn't generated as a list of vertices, and faces. 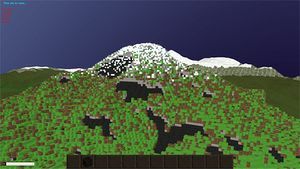 The world is generated from different height layers, stuctures like trees, and ore spawn properties. From that description you'll get a long graph in which you can see all blocks representated as beeing somewhere on the map. That's the idea of minecraft but to create a nicer feeling, a heigh rate of detail at low cost, you need to create a system that renders many things near you and only shaped far away. Because of that phychi.com's creator user:Antonio chose to use an exponential system: per each 2n chunks there is one group of representations adjusted to the distance to the camera/player. Saving... well I think you know what that's good for. Now how we keep our data small, and with that servers cheap, and your internet connection fewer occupied: We only save changes: only when a chunk was changed at all it will be saved, otherwise it just will be regenerated the next time a players walks near it. Also there might be a block property that allows to be not saved, so a chunk where just one grass block was destroyed just don't need to be saved, because the grass would have regenerated anyways. Without that method of saving only differences, we would get into big trouble with saving data, especially when you use your map together with friends, and that a long time. Also this allows easily new structures, e.g. from mods or a version change, to be added to the world without a required new world or crazy artefacts. The world can be configurated at http://play.phychi.com/config?world=YourWorldName or just click on the symbol of this world at http://play.phychi.com once. You can use my basic configuration at http://play.phychi.com/config/?world=alpha as example. Mod- and plugin settings are special settings requested by mods and plugins to make their functionality more flexible. Additional to the possibility of creating config settings and to view and to change them, as the owner you can also set the permission level/few player ids who are allowed to change those values. Mods and Plugins should deliver that information theirselfes as good as possible when they run on the game of the owner. Since there is a lot of information and probably a lot of configurable mods installed, configurations are shown in a kind of tree. The standard format for more complex things than numbers or strings is JSON. Additional formats should be added by the mods/plugins though JSON is if compressed as zip and converted to base64 not that bad. It's a list of all players who were banned once or got a special permission level. Players with a 3 higher permission level than another one can ban those players from 30mins to 14days! At the moment only the owner himself can set permission levels. The second number displayed is the time a player is banned until he can rejoin again. This page was last modified on 11 January 2017, at 09:42.